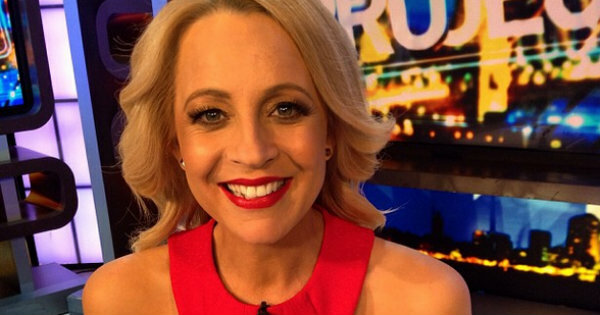 Popular television host Carrie Bickmore and partner Chris Walker have welcomed a baby girl – and released a gorgeous picture to introduce their precious new addition to the world. The Project presenter announced baby Evie’s arrival on Twitter today. Evie joins big brother Ollie, 7 – Carrie’s son from her marriage to late husband Greg Lange, who died five years ago. Carrie has been in a relationship with Chris, a former producer on the show that has made her a household name, for more than two years. Carrie was flooded with congratulations from admirers and colleagues, and tweeted a photo of her beautiful new bundle about two hours later. Carrie, 33, announced her second pregnancy live on air in October. Though her pregnancy progressed mostly unseen under The Project desk, she did share a few pregnancy snaps along the way, such as this one from the beach in January. As much as I love love love my job…I am loving being on the coast doing a whole lot of this. I'll be back on the show in a week. #exhausted #vitaminD #lethargic #IAmWearingPants! A few days before the birth, she joked about her baby being the “size of a pumpkin”. We hear you Carrie! It’s been quite the week for Australian celebrity baby news. As we posted on our Facebook page earlier today, much-loved Offspring star Asher Keddie also announced the birth of her first baby with husband Vincent Fantauzzo. Their son, whose name is yet to be released, is younger brother to Luca – Vincent’s four-year-old son from a previous relationship. Congratulations to both families on their safe arrivals!